westcoastmusic: Huey Lewis's first band Clover now released on cd! Huey Lewis's first band Clover now released on cd! In 1971 Huey Lewis joined the Bay Area band 'Clover', and around this time he changed his name to 'Huey Louie' after two of Donald Duck's nephews (and this eventually evolved into 'Huey Lewis'). Sean Hoper joined the band in 1972 - other members of the band were John McFee, Alex Call, John Ciambotti, Mitch Howie, and Mickey Shine. Huey played harmonica with the band, and only sang lead vocals on a few tunes. 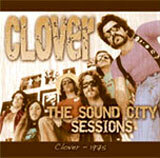 Clover recorded an album in 1975 (featuring Jeff Porcaro) at sound city studio's in LA and was never before released on cd until sonicpastmusic.com has sent it out screaming. John Mcfee (Southern Pacific, Doobie Brothers) has re mixed several cuts as bonus tracks, and Sonicpastmusic have also included all the original mixes and recordings. Sure you will enjoy this great product.